EW – Richard Madden is used to playing men responsible for the lives of others in perilous positions, but have his characters gotten any better at protecting those around them? In the BBC’s Bodyguard, created and written by Jed Mercurio — perhaps best known for tense, crime procedural drama Line of Duty — Game of Thrones alum Madden stars as police officer and PTSD-suffering war veteran David Budd, who is assigned as a protection officer to the U.K.’s controversial Home Secretary Julia Montague (played by Line Of Duty’s Keeley Hawes). While a divided government deals with a heightened terrorist threat in the country, Budd has his own demons to work through — and Montague doesn’t make his job any easier. As the Home Secretary aims to introduce a new bill that outlines increased state surveillance, Budd grapples to protect her from those opposed to such legislation as well as the greater threat of domestic terrorism that pervades London and the rest of the country. Throw into the mix his own traumatic past and a young family to look after, and PPO (personal protection officer) Budd is in for a ride that makes the horror of Robb Stark’s Red Wedding look, well, still horrific, but also like another day at the office for the protection officer. Originally broadcast in the U.K. in late August on the BBC, the show’s electric pace and edge-of-your-seat suspense kept audiences talking incessantly about the drama (and blowing up text threads on Sunday nights! ), before tuning in with bated breath weekly, only to be thrown for another loop by the multitude of careening twists and turns, and perpetually unsure who to trust. Ahead of the show’s Netflix debut, EW caught up with Madden — who also stars in next summer’s Elton John fantasy Rocketman — to learn more about his mercurial character, that (potentially!) explosive opening sequence, and whether David Budd would’ve been any good at protecting the doomed Stark family members. DEADLINE – After finding huge success in the United Kingdom, Bodyguard will make its way stateside on October 24 when it debuts on Netflix. The new trailer for the political thriller dropped today and features a wild amount of tensions rising between Game Of Thrones alum Richard Madden and Line Of Duty‘s Keeley Hawes. Set in and around the corridors of power, Bodyguard tells the story of David Budd (Madden), a heroic, but volatile war veteran now working as a Specialist Protection Officer for the Royalty and Specialist Branch (RasP) of London’s Metropolitan Police Service. When he is assigned to protect the ambitious and powerful Home Secretary Julia Montague (Hawes), Budd finds himself torn between his duty and his beliefs. Responsible for her safety, could he become her biggest threat? The series also stars Gina McKee (Line of Duty), Sophie Rundle (Peaky Blinders), Vincent Franklin (Happy Valley), Pippa Haywood (Scott & Bailey), Stuart Bowman (Versailles) and Paul Ready (The Terror). Bodyguard is produced by World Productions, an ITV Studios company. The series is executive produced by Jed Mercurio (Line of Duty, Bodies), Simon Heath (Line of Duty, Save Me, The Great Train Robbery) for World Productions and Elizabeth Kilgarriff for BBC directed by Thomas Vincent and John Strickland, and produced by Eric Coulter and Priscilla Parish. 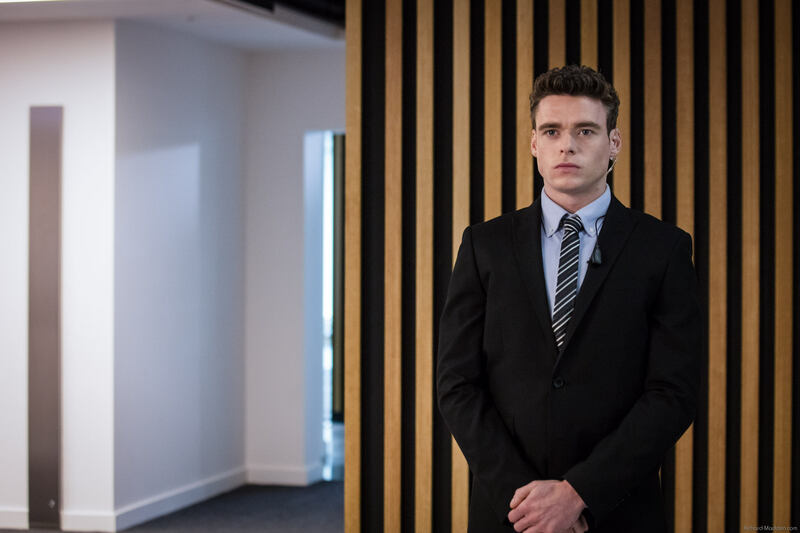 Press: BBC’s ‘Bodyguard’ Bows Out Ahead of Netflix Launch With Massive 47.9% Share in U.K. Starring Richard Madden (“Game of Thrones”) and Keeley Hawes (“The Durrells”), “Bodyguard” went out the gate strongly in the U.K., where it was the biggest launch for a scripted series in more than a decade. Aside from soccer, the ratings for Sunday night’s finale make it the most-watched program of 2018 in Britain. It was the biggest drama across all channels since an episode of “Downton Abbey” on ITV in November 2011. For the BBC, it was the biggest drama since its Christmas Day episode of “Doctor Who” in 2008. Madden plays David Budd, a war veteran-turned-cop and special protection officer who is assigned to guard Home Secretary Julia Montague (Hawes), who is targeted by mysterious assassins. Sunday’s denouement was hugely anticipated in the U.K., with the series achieving the rare feat of running weekly and becoming genuine water-cooler TV. The BBC launched the first three episodes on its iPlayer service when the series opener went out via regular broadcast, but the show ran in weekly installments thereafter. The first episode has become the most-requested ever on iPlayer and the closer helped drive the streaming and catchup service’s biggest ever day, with 12.3 million program requests. The final part ran to an extended 75 minutes. Series creator Jed Mercurio, whose crime series “Line of Duty” was also a hit, told BBC radio Friday that conversations with the pubcaster about a second season are just beginning. “We know that people out there are loving Series 1 and that there would be an appetite for Series 2, but we’ll just have to wait and see,” he said.